The StackPanel control allows stacking contained children either horizontally or vertically. 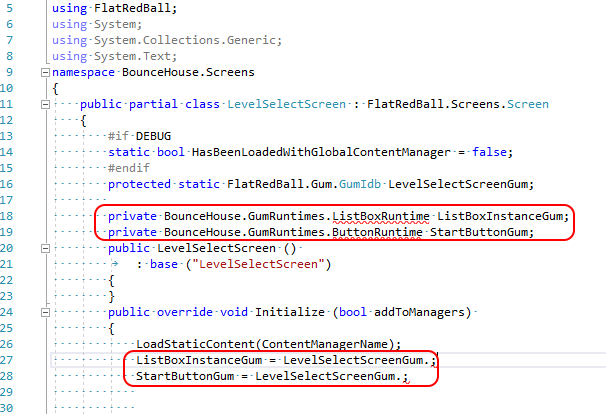 Note that this functionality is not new, Glue has had stacking available before FlatRedBall.Forms 1.0. 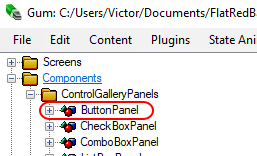 The StackPanel simply provides a control similar to the WPF StackPanel to simplify the creation of UI in code using a familiar interface. We can compare how to create a StackPanel in FlatRedBall.Forms 1.2 and compare it to how this would have been done in 1.1. Notice that the AddChild function helps make StackPanels even simpler to work with, as opposed to setting the parent on the desired child – which is both wordy and also confusing. For additional information on the StackPanel control, see the StackPanel page. Previously all Gum runtime objects would be added to the project in the same folder and part of the same namespace – YourProjectName.GumRuntimes . The latest version of the Gum plugin for Glue adds controls to namespaces matching the folder structure in Gum. The runtime object will be generated to be part of the YourProjectName.GumRuntimes.ControlGalleryPanels namespace. 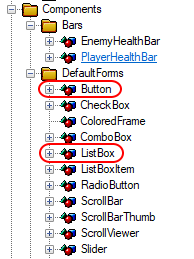 This change allows for multiple controls with the same name to be added to a project, as long as they exist in different folders. Since components now include subfolders in their namespace, existing projects which have components in subfolders may no longer compile until some changes are made. Any reference to a component which has had its namespace changed must be updated. Of course, generated code should update automatically, but custom code may need to have a qualifying namespace changed, or to have its using statements updated. If you have accessed an object from within a Gum file in Glue, and that type is now in a subfolder, you may have compile errors in your generated code for your Glue Screen/Entity. Notice that the types SourceName dropdown has the correct type in parenthesis.